You’ll have to end up sleeping with one eye open after reading about these four bad boys, who have better lines, better outfits, better babes, more gadgets and have way more fun before they go out in the climax reel(with a bang). Our Bollywood heroes have been tormented sick by these egomaniacs, who seem to steal the show with punch lines that they deliver in deep baritones and vintage maniacal laughter that resonates deep within the audience’s brain. 1)“Crime Master Gogo” naam hai mera: Aakhen nikal kar gotiyaan khelta hu main (I will remove your eyes and play marbles with them). We understand why you shudder so and also why you feel like running to your mother’s bosom after hearing this dialogue, from the famous(for all the wrong resons) one and only Shakti Kapoor, which he seems to be delivering on loop right from the start of the hilarious movie, Andaaz Apna Apna(1994). 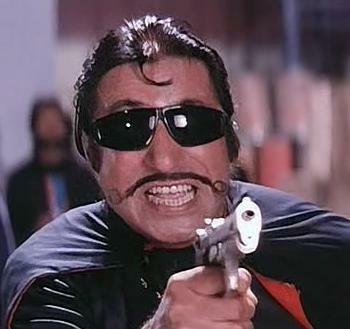 Introduced in the movie as Mogambo’s nephew (bhateeja), Gogo, dressed up as a cusp between a superhero and a pirate, due to delivery of lines like “Dhakki tiki dhakki tiki dhakki tiki thaa” at the climax scene (when he realizes that Aamir Khan alias Amar shoots the last bullet from the gun in air), is now officially a cult comic character in Indian cinema and has a dedicated fan following where people are emulating his iconic moustache. M.A.R.D is what they call themselves, we monkeys believe. The unmatched king between the villains, Dacoit Gabbar Singh, played by debutant Amjad Khan back then, is so iconic that we feel this space isn’t quite enough to tell you enough about the man. Or maybe you already know facts all to well, like him terrorizing the rocky terrain of Ramanagara yelling out lines like “Holi kab hai holi?” and “Door kisi gaon mein jab baccha rota hai toh uski maa kehti hai, so ja beta nahin to gabber aa jaega”( If any kid cries in any far off village, his mother reminds him to shut up and sleep else the big bad Gabbar will come) accompanied with his satanic laughter. Another badass, Thakur, isn’t too pleased (to say the least) that we have him onboard with us, but we reminded him that since he is still numero uno in the list of Bollywood Villains, love him or hate him, you simply cannot ignore him. 3) Is he happy(Khush)? He better be, else brace yourself to face the wrath of this Military uniform clad villain with blonde hair who might hold you hostage in his den, that looks like a sci-fiction set, along with hired Chinese scientists to make missiles and inflict maximum casualties. What’s more, he also has his group of minions who address him as ‘Hail Mogambo’. Pretty epic according to us, we double dare you to top that. 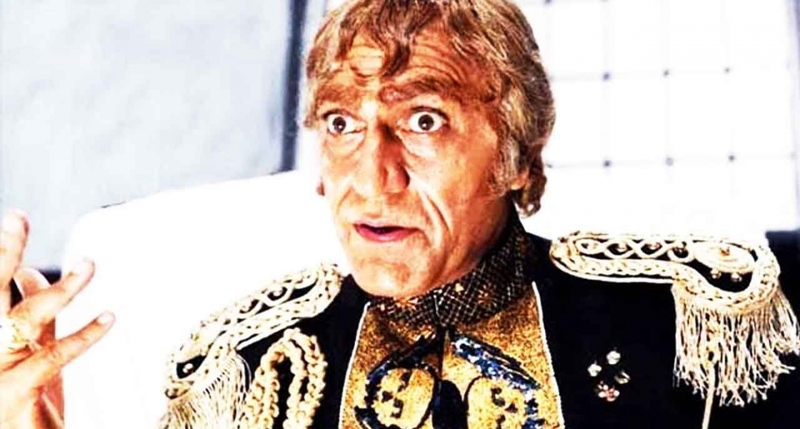 This legendary role was played by the late and great Amrish Puri, who has done over a few hundred films, mostly playing negative roles throughout the span of his career. 4)Shakaal was a villain with his own island, shark and crocodile tanks (which people are dumped into at periodic intervals of time) , and surprisingly high tech gadgets for the time, leave us with the feeling that we just stepped into the shoes of the Indian version of a Bond villain. Don’t you stare at that bald head for too long, that is just for Kulbhushan Kharbanda to caress around nonchalantly. Better not breathe too close to him if you meet him at a party too, as ‘Zehrili gas deheere deehree is mehfil ko aur bhi rangeen banayegi”( Poisonous gases are slowly going to make the party more colourful). 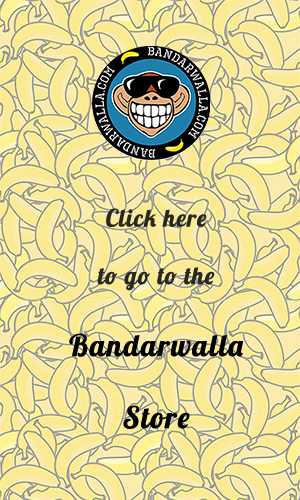 Now that we’ve reminded you of these bad boys, stay tuned to Bandarwalla for a super awesome and cool tee shirts coming your way as fast as these villains who strike terror in the hearts of the innocent. Till next time fellow humans.